Ericka Huggins is a human rights activist, poet, educator, Black Panther leader and former political prisoner. For the past 30 years, she has lectured throughout the United States and internationally. Her extraordinary life experiences have enabled her to speak personally and eloquently on issues relating to the physical and emotional well-being of women, children and youth, whole being education, over incarceration, and the role of the spiritual practice in sustaining activism and promoting change. Rick Butler is a multiple EMMY award-winning director and cameraman with over 25 years of experience in documentary filmmaking. Butler won an EMMY for his direction of the PBS documentary, The Fillmore. His camera work has supported films for several flagship PBS series: Frontline (e.g. School Colors, 1995), American Experience (e.g. Freedom Riders, 2011), American Masters (e.g. Paul Robeson: Here I Stand, 1998.) Mr. Butler has shot many independent documentary films that have aired on PBS and in general broadcast and educational distribution. Additionally, Mr. Butler has extensive experience in the corporate and entertainment fields, including direction of several documentary shorts that accompany Pixar films on DVD. Rick is most interested in and proud of films that contribute to positive social change such as his work on The Color of Fear, Mirrors of Privilege: Making Whiteness Visible and a project in progress with activist Van Jones that examines environmental justice, Green Shall Overcome. Sarah Crowell is the Artistic Director at Destiny Arts Center, where she is responsible for the artistic quality and mission-alignment of our performing arts programs and public performances. She communicates the depth of our programming to wider audiences through strategic partnerships, speaking engagements and professional development. Sarah also co-directs the Destiny Arts Youth Performance Company, which she co-founded in 1993. Originally from Canada and the Bahamas, Sarah has been with Destiny since 1990 in a variety of roles. She served as the organization’s Executive Director from 2002-2007. 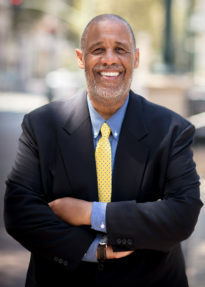 James Bell is the Founder and President of the W. Haywood Burns Institute. The Burns Institute has worked in over 200 counties in 23 states to engage justice stakeholders and communities across the country to build equity in the administration of justice. He has trained and addressed thousands of human services professionals and community members on a vision of well-being as the preferred and most effective way to achieve community safety. James has appeared on numerous national television shows, conducted several radio interviews and written blogs for the Huffington Post. He has authored sections of published anthologies on school discipline, youth justice history, and health. James has extensive experience in the international justice arena: he assisted the African National Congress in the administration of the juvenile justice system in South Africa and consulted with the Nelson Mandela Children’s Fund. He has worked with government officials and activists on the human rights of children and restorative justice in Cambodia, Kenya, Brazil, New Zealand and China. He attended California State Polytechnic University and Hastings College of Law.